I looked at this recipe as a possible good gluten-free alternative to regular spaghetti. I'd never tried spaghetti squash before and hubby wasn't sure how he would feel about it. Whether you care for squash or not, I would have to believe you would find this delicious. We did and it's a new favorite dish in our household. Thank you! Made this tonight…having the other half tomorrow for lunch..Thank You! Al the point and calorie post crack me up…if you eat only when you are hungry…quit when you are satisfied…you can eat what ever you want. I have my squash roasting in the oven as i type this. Can't wait to try this!!! Does anyone know if this freezes well or what would be the best way to reheat? Made with lean sausage and soy cheese. Yum. Very easy too. Tryed this tonigh and it truned out amazing! Added mushroom and it was delish, will be making this one again!! Thanks for the recipe idea. I made this tonight, but instead of using the grilled chicken, I used your recipe for healthy chicken nuggets. Turned out great. Tasted like chicken parm. For the microwave instructions….do you cover it with anything? Or poke holes in the skin or put a moist paper towel in the oven when nuking it? I'm going to attempt to replace the pasta in your cajun chicken pasta with spaghetti squash and see how it goes!!! Any advice? I made this last night. I roasted the squash as directed and it was dried out and tough. If I do this again I will bake the squash as I usually do, that is to cut across instead of lengthwise, placed cut side down and water added to the covered casserole dish, bake at 350 for 1 hour. It turns out perfect every time. The rest of the recipe was tasty but with the squash being dried out and tough it pretty much ruined it. I will try again tho using my method of baking the squash. I just made this today and can not wait to try this. My only concern is when I put everything in the weight watchers calculator it says its 8 points not 6. I only ever cook for just myself, but obviously I'll be making at least 2 servings – one with each half of the spaghetti squash – when I make this. Can it be frozen and reheated? Or, if I save the second half for lunch the next day, can I reheat it in a microwave? Thanks, I'm looking forward to making this! This recipe was just begging to be made! I already had a spaghetti squash on hand and had made grilled chicken the night before. 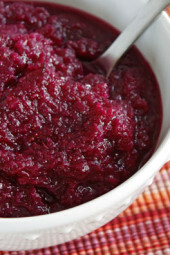 So I halfed the recipe since I only had 1 squash but I paired it with a salad for lunch today and just one word – YUMMO! I forgot to snap a photo but it came out wonderful. Keeping in the squash half kept everything contained nice and neat. I got a lot of compliments on my "fancy" lunch. I used Sargento's off the block shredded part-skim mozzarella but next time I may want to spend some extra points and try melting a slice (or two if they're thin enough) of that Land O' Lakes 4 Cheese Italian blend over the chicken. Thank you for sharing your wonderful recipes with us, Gina! Anyone else getting 8 Points+? I entered the nutrition info as listed in the recipe in my WW calculator but I still get 8. WW counts the points value for veggies in their recipes which could be why the number is higher. I love anything with cheese and so does anybody who has a sense of taste. This looks so yummy and my mouth is beginning to drool. I am so going to make this for dinner today. This was amazingly delicious. I had the marinara made in advance luckily but next time I will also bake the squash earlier in the day to save some time and avoid burning my fingers. This is in my rotation now. Even the teens loved it. Thanks Gina. Made this tonight and it was amazing! Will be making this again for sure. The hubster and kidlets loved it as well! I just made this recipe tonight and it was fantastic! The serving size is definitely filling! The only thing I did different was to bake chicken cutlets with some seasoned panko bread crumbs instead of grill them. Added another point, but this recipe had points to spare. Delish! This will be on my menu next week for sure! I made this last night for dinner and it was SO delicious. I will definitely be making this dish again and again. Made this last night and it was awesome! Even my husband, who claims not to like spaghetti squash, loved it! So easy and filling. We made this last night and my husband was shocked at how good it was! thanks!!! Great recipe, Gina, thanks for posting. I really enjoyed it, and used the fresh mozzarella and homemade sauce, which made it fantastic. Question about the "spaghetti" strands – should they be a bit crunch or did I undercook my spaghetti squash? 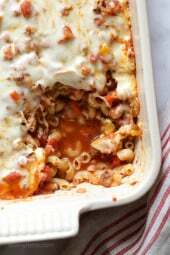 It shredded quite easily after an hour in the oven but had a much different texture than pasta – is that typical? It's definitely going to have a different texture than pasta. It'll depend on your oven temp and how long you roast the squash for. I noticed that I had some more crunchy strands roasting it this way than I do when I roast it in the oven uncut. Plus it was on a rack closer to the heat which may have contributed to that as well but I liked the bit of crunch. Spaghetti squash can come out very watery especially when reheating! It'll always be your personal preference. Delicious! Made tonight and my 7 yr old loved it! I also made the chicken broccoli noodle casserole from your top recipes list and that was great too! this was awesome!! i used grilled pork loin instead of chicken. even my husband ate it! next time i will make more so i have leftovers!!!! I tried this recipe and it was so good, I will definitely make it again. OMG!!! I made this for dinner It was AWESOME!!!! Everyone loved it even my kids who are very picky. Thank-you for sharing this recipe. Delicious! Made this tonight for dinner and even my 2 and 4 year old kids liked it! Very filling and easy to make…thanks! The 8 points plus sounds right, I did the same thing and it indicated 8 points too. I'm really excited to try this. I was eating spaghetti squash non-stop and I think I just got tired of it. I think this recipe will get me back to liking it again! I made this tonight and it was awesome! Traded in the chicken for some ground turkey and used a little bit more sauce than called for. Plus did a blend of parmesan and the mozza. Turned out so great! Thanks! We had these for supper tonight. We both loved them. Next time I want to add a little more marinara sauce. Yummm! Made these last night with sausage/ground turkey instead of chicken. Delish! Thanks! I had the hardest time cutting my spaghetti squash in half. I thought that thing might have been petrified because that sucker just wouldn't give. I finally got it but do you have any tips on how to cut spaghetti squash… you know, without losing any fingers? I microwave them for a few minutes first, that softens them up enough to cut in half. You must pierce the skin with a knife a few times first, so it doesn't explode! ask at your store if someone can cut it. That top picture is quite possibly the most gorgeous thing I have ever seen…!!! These sound amazing! I need to make sure to grab some spaghetti sauce at the store this week! Delish! Yuuuuuuuuuuuuuuuuuuum! 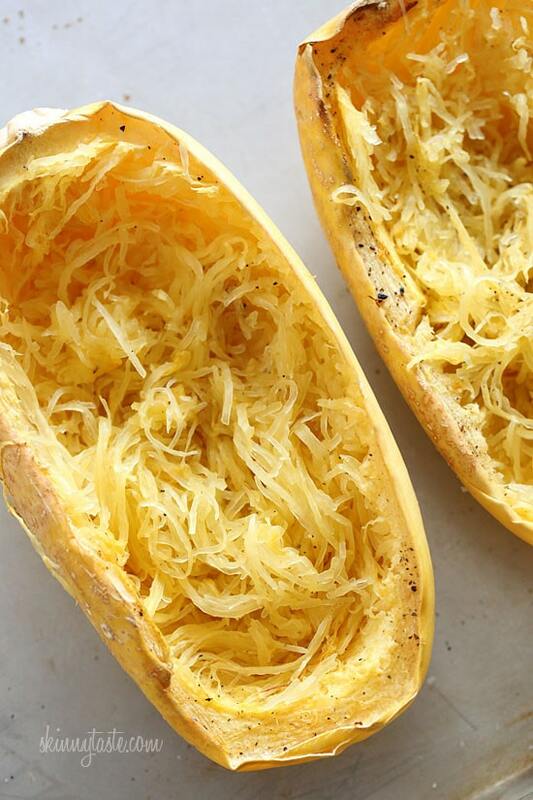 When I first had spaghetti squash "spaghetti" I was stunned! It was so, so, so, so good and I didn't miss the regular pasta at all. This looks *FABULOUS* and I can't wait to try it! I love your blog. I just joined Weight Watchers (again) and your recipes will keep me on track, plus they look delicious. I made a vegetarian version of this last night (no chicken). I added mushrooms and extra cheese. It was so filling and delicious! Another great recipe, thank you! Just made this for my roommates and I and it was a giant hit! No one had even heard of spaghetti squash and we were all pleasantly surprised! I made this for dinner tonight, and it was good. Before removing from the oven I broiled the squash for 2-3 mins to brown the cheese. Think next time I'll make it without chicken, as I tend to eat more vegetarian cuisine. Made this tonight for dinner, and it was yummy. Only problem I had was the squash became very watery on the re-bake when I was melting the cheese. It watered down the layer of marina that was under the chicken. But very filling–my squash was a little on the large side but about halfway though I was getting full. Just pinned this to put on next week's meal plan. This.looks amazing! Thanks for your awesome recipes. I'm going to tell everyone I know about your site! This looks amazing! I've just discovered your site and am totally in love. Thanks so much for the incredible food! I hope you don't mind, but I've linked to this blog on my own blog. 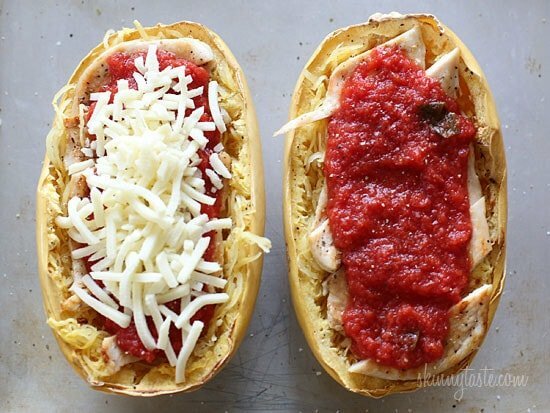 Chicken Parmesan spaghetti squash boats or Baked Chicken Parmesan spaghetti squash boats! Great recipe! 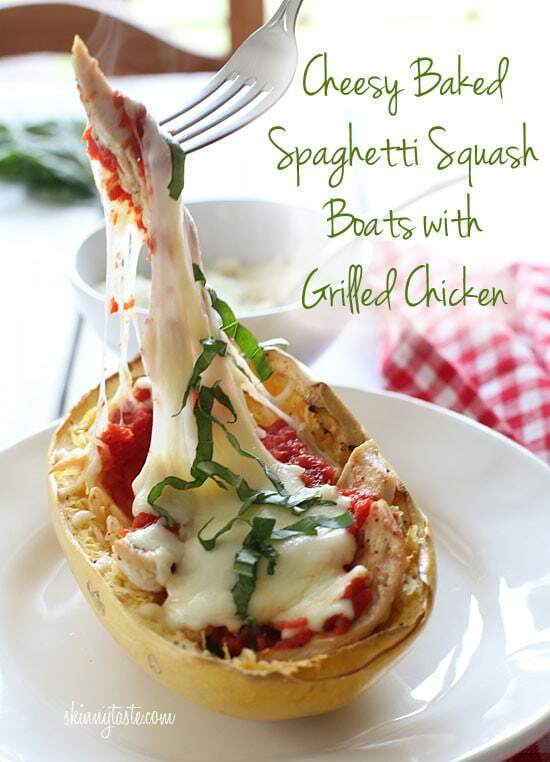 I've always loved spaghetti squash! I made this tonight and it was absolutely amazing! This is the first time I have ever had spaghetti squash and you were right about it absorbing the flavors it's paired with. I made the marinara recipe you posted to go with it and that was wonderful too! I only have one question though. When I plug the recipe into the WW recipe builder, it says 10 points vs. the 6 you mention in the nutritional info. Am I doing something wrong? Looks delicious! I can't wait to make this recipe. I'll admit that – like your man – I was cynical about spaghetti squash at first, but all it took was one bite to win me over. Now I'm a BIG fan! OMG! Thank You So Much for sharing this Recipe! I made this tonite and it was AMAZING! and my Boys (hubby & son) Loved it as well! Thanks! 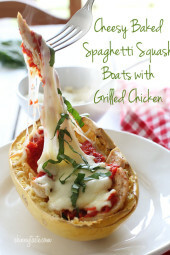 I LOVE spaghetti squash!Could I use pre-cooked chicken strips to save some more time? This looks delicious! I haven't been much of a meat eater sense the beginning of my pregnancy, how would this be without the chicken? And another silly question, i have never had spaghetti squash, do you eat just the insides or the whole thing? I think it would be just fine without the chicken, maybe add more veggies that you like!! You don't eat the outside of the squash, just fluff up the flesh insides. It is almost a little sweet and very delicious. Looks delicious! I still have yet to try out spaghetti squash. I made this last night for dinner & it was delicious. My husband is thrilled when anything uses the word cheesy in the description & he was definitely a fan after eating it. I added an extra chicken tender to his (he's a big guy), but found half was enough for me. Another great recipe, Gina! this sounds so awesome! This year, my resolution is to cook much more from your recipes as I Point my way through Weight Watchers! thanks for your love of low fat cooking!! I made this last night and it was a hit- so flavorful and satisying without the guilt! Huge serving size, too. I did use whole milk mozzarella. Also, the fresh basil makes it! This looks fabulous and looks like its a perfect light dinner! It's sad to say I've never cooked with it too date… Must make soon! 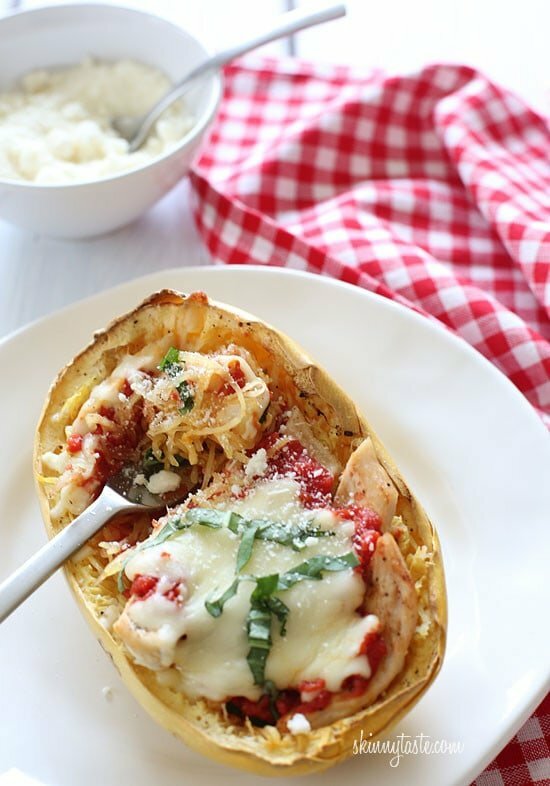 I absolutely LOVE spaghetti squash and I'm always trying to find new ways to use it. This looks like a great one!!! Now that is something really delicious. Makes a perfect dinner, can't wait to try this. Wow, I have never tried this before. Squash is really something I avoid eation, but the way you made this dish makes it so so innovative and appealing! Yum!!!! I am going to be using this recipe for sure! I just started my own blog, because in 2013 I am determined to change my eating habits. 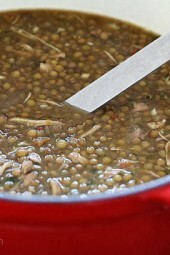 Trying to cook daily, do crock pot meals ahead of time, and eat healthy… and post a few of my own recipes!! Thanks so much for posting all your wonderful stuff!! Seriously… I am a little upset that I can't make this RIGHT NOW. I have fallen in love with spaghetti squash and eat it all the time. This definitely looks like a dinner I need to try! Wow this looks amazing! I need to try this in a veggie version Yum! I'm so glad that your lucky because I did the same and it turned into an utter disaster. Now my boyfriend doesn't eat anything that I prepare. This might sound silly. But how exactly do you make the little squash speghetti strings? The pulp of the squash turns into spaghetti-like strings once it's baked! Once you run the tines of the fork across the cooked flesh, it will strand right up. Super easy! I have never had spaghetti squash before. do you eat the entire boat or just eat the inside? My 8 year old and I both love spaghetti squash. When we saw this, even SHE was going "Oh, Mom! You *have* to make this." Looks wonderful! This looks soo delicious 🙂 I can't wait to try this! Where are the 35g of carbs coming from? It seems like a lot. Not sure but your net carbs are actually less because you can subtract 7g of fiber from the 35 carbs, so not as bad as it may seem. The carbs come from the sauce and the squash, at least that's where mine came from when I put the recipe into MFP to log it in my food journal. Spaghetti squash has 10 grams of carbs per cup. The sauce has 9 carbs per 1/2 cup, and about 5 grams per cup of the cheese. No carbs in the chicken…total if using a full cup of the cheese…about 24 grams. Less if using less than 1 cup of cheese. oh…and to add additional veggies, I add bell peppers/onions. OMG … this looks amazing! Can't wait to try it! This looks awesome! What do you think using fresh mozz would do to the points? This looks great, I am adding it to the menu for next week 🙂 How do you know if spaghetti squash is ripe? Spaghetti squash is fantastic!!! this recipe looks Fantastic too!! i'm way too excited to make this right now! wish i could sneak out of work and start crackin! I love spaghetti squash; it's so versatile. This looks wonderfully cheesy and delicious, plus I'm loving those nutrition stats. Ohhh, definitely making this ASAP!! It's been awhile since I've had spaghetti squash and I love the simplicty of the ingredient list. Thanks for another great recipe! I've always wanted to make spaghetti squash!!! Looks delicious!!! Would this be freezer friendly? It looks delicious, and I'm trying to build up a stock of frozen meals for my maternity leave! Cant wait to make this!! Yum! This looks fantastic, I just had spaghetti squash with grilled chicken for dinner last night, next time I will make it like this! Thanks for the great recipes! This sounds yummy because you can have 'some' pasta without the total carb overload. This looks amazing. I will def have to try. What if you don't want that much mariana sauce? Do you think it will make a difference in points? No, I started with half and the points were the same, but I felt the squash needed more sauce. I made this for lunch today and it was delicious. I added some paprika to my chicken to spice it up-very filling and generous portion for such few points!